Solar panels in space could be a huge deal. The energy they collect could be beamed down to Earth or used to power spacecraft. But like so many other space travel and space exploration issues, the problem has to do with size. For a solar panel array to be worth the trouble it takes to get it into space, it would have to be pretty big. And to get something pretty big into space, you have to use a whole lot of resources – and most space shuttles really don’t have the room to carry a huge apparatus. 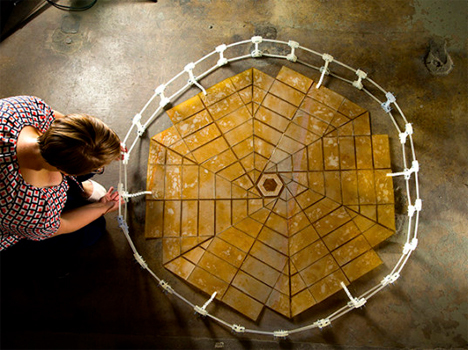 Brigham Young University (BYU) researchers, working with NASA’s Jet Propulsion Laboratory, have made a big step toward making space-based solar arrays possible by looking to the ancient art of origami. Their conceptual solar array takes up just 8.9 feet in diameter when in travel mode, but then folds out to an incredible 82 feet wide. The unfolding takes only one gentle pulling motion to turn the closed array into a huge circle. The movement is based on the Miura Fold, a technique originally developed in the 90s by Japanese astrophysicist Koryo Miura. 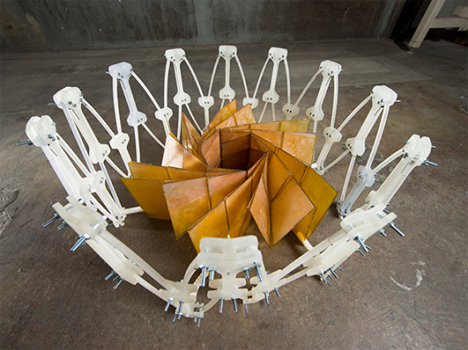 The intricate and efficient fold would let the array travel into space taking up very little area on the spacecraft, then expand to full size once there, providing an impressive 250 kilowatts of power. The team has already created a 1/20th scale model of the structure to prove that the folding method is both viable and attainable. In the future, the folded form of the solar array could go up wrapped around a spacecraft inside of a rocket. Once in space, the shape could be fully deployed to capture huge amounts of clean energy that could power spacecraft or be sent down to use on Earth. See more in Energy & Power or under Science. August, 2014.